Now, a bit of video: almost 3000 people died as a result of the Puerto Rican hurricane disaster, but few seem to care, and certainly no one in the Federal government has done much about it to the shame of the Trump Administration. 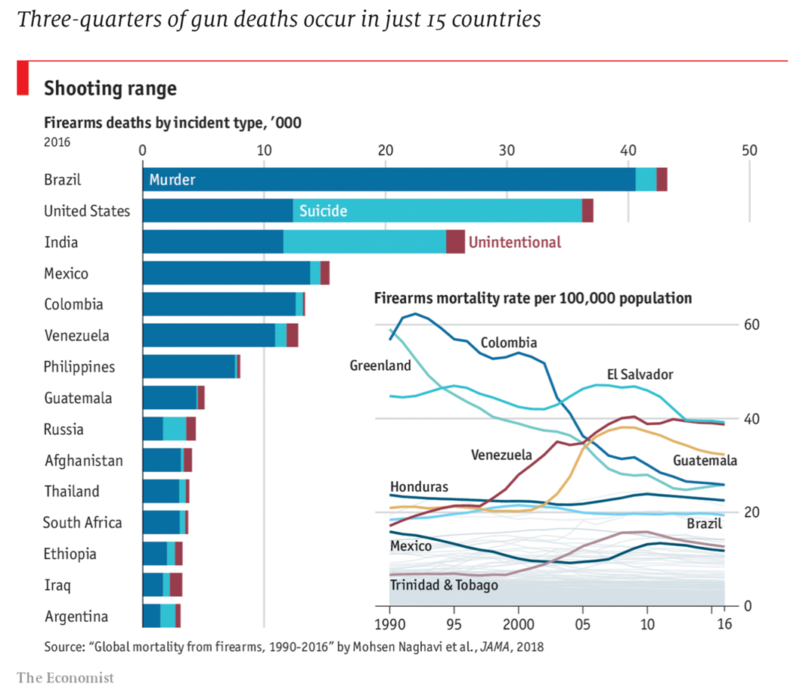 Next, some graphical grimness: A surprising proportion of worldwide gun deaths happen here in the United States, and a rather surprising portion are suicides. 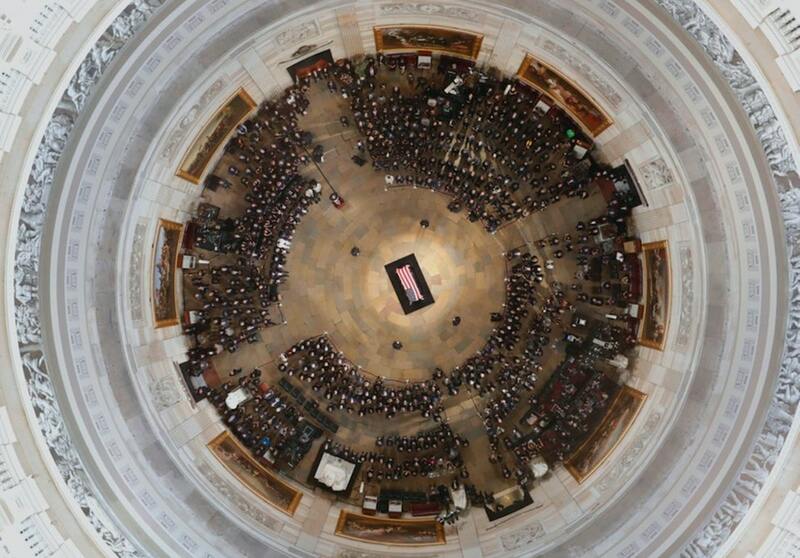 John McCain’s funeral arrangements are essentially a big middle finger to the sitting President: TPM. Kelli Ward ran a uniquely inept and crazy campaign for the GOP Senate nomination; pity she didn’t win…: WaPo. Blake Morlock wonders just who our 2018 Senate nominees really are and, because they are both political chameleons, can’t come to any satisfactory conclusions: Tucson Sentinel. The Arizona Supreme Court steps into nakedly political territory and keeps Dark Money (Capitol Times) and Red For Ed props off the ballot, denying voters their chance (Arizona Central) to check the State Lege: Arizona Politics. Journalists Dylan Smith, Joe Ferguson, Jim Nintzel, and Dan Shearer discuss the results of the Arizona primaries: Buckmaster. 61% of Arizona voters prefer a caretaker for McCain’s Senate seat more like McCain than Trump: The Hill. Kyrsten Sinema’s personal up-from-poverty story is inspiring and instructive of how America is supposed to work: WaPo. Coming to terms with the legacy of John McCain requires looking at the bad he did, as well as the good: The Nation. Senator Elizabeth Warren is trying to save capitalism — if the capitalists will let her: Atlantic. Paul Krugman reminds us, an authoritarian government can happen here, if we let it: NYT. Is Trump going mad(Vanity Fair)? Now he’s calling and screaming at people all weekend, and telling Evangelical leaders that he’s repealed laws that he hasn’t, and claims that the left will become violent if we win control of Congress? Wow…just, wow: NBC News. Don McGahn has been one of the most consistent voices of reason restraining Trump; now he’s leaving in the fall… which is a surprise to McGahn: WaPo. Andrew Gillum, the black mayor of Tallahassee, pulled out a come-from-behind win of the Democratic Florida Gubernatorial primary, and immediately draws a dog whistle racist comment from his Trump-supported GOP rival, Ron DeSantis: CNN. The Trump Administration is denying passports to Americans born along the border, claiming widespread birth certificate fraud with no proof: WaPo. 15 reasons why Trump’s supporters will not abandon him, no matter what he does: Salon. Will the Florida Gubernatorial race between Gillum and DeSantis be a preview of 2020? Gillum is leading in polling outside the MOE. WaPo. Trump cancels planned COLA pay raises for federal employees citing economic hardship, even as he crows about how great the economy is; Bright side? Several Virginia-area Congresscritters in his party will likely be sent down by constituents as a result; will Trump shut down the gov’t to enforce it? : LA Times. A new report details how taxpayers subsidize giant corporations‘ that pay their employees too little to live on (summary here): Institute for Policy Studies. Anti-immigrant Right Wing still exploiting tragic death of Mollie Tibbetts against community wishes: PSMag. Despite Trump’s abrogation of the nuclear deal, Iran is still abiding by terms of the agreement: Informed Comment. Israel lobby staging fake protests and spying on Americans in America: Informed Comment. Will the U.S. lose the power to financially sanction foreign nations through the payment system due to over-use? : Ian Welch. I admire how much you comment on BforA posts. I am looking forward to our debate on Thursday, September 6th. So under a Democrat county recorder, 66 polling places open late and a card reader fails to accept tribal enrollment cards as id. Yet not a peep is heard from any BfA bloggers about incompetence or disenfranchisement. Seems hypocritical to me, given the thrashing you gave Reagan and Purcell last time. Whataboutism. The debate style of losers.